Carrie and Sidney spent the rest of their day off shopping for the baby and working on the nursery even though it was still a little ways off before Carrie gave birth to their baby. They had fun and it was quality time spent together as a couple. "I think we did a great job with the nursery" declared Sidney as he put his arm around Carrie's shoulders and admired their work. "I totally agree. It looks perfect and I love it" Carrie said as she leaned her head on Sidney's chest. "We are a good team" chuckled Sidney as he kissed the top of Carrie's head. "Yeah and now I am starving so I am heading to the kitchen. Do you want anything, Sid?" asked Carrie as she walked out of the room. "Let's just go over to that Italian place nearby so that you don't have to do anything." "Hey I am not going to complain about that at all" Carrie said as she stood in the door way. "Cool now go and get ready sweetheart" Sidney said as he followed her into the bedroom. They enjoyed a nice dinner at the Italian restaurant. 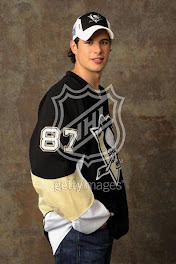 As they were leaving a few people stopped Sidney for autographs and pictures and he was ever the nice guy about it. As Carrie was waiting on Sidney, her cell phone rang and so she looked at her phone and it was Craig. Craig had finally gotten all of the paper work done and had just recently moved into his condo which was on a floor above Carrie's in her building. "Hey Craig, how's the new place?" Carrie asked as she walked over to look at a store window. "Oh its getting there slowly Carebear, which is why I am calling you. Would you like to come over and check it out tonight since I am going with the team on the road trip?" asked Craig. "Yeah Sid and I are just leaving the restaurant as soon as he finishes talking with some fans, I would love to see your place." "Cool well then just come on over when you get here, Carrie." "We will so see ya shortly, Craig." Sidney had finally finished signing autographs and taking pictures and he looked for Carrie and then saw her talking on the phone. She had ended up by Sidney's car waiting on him to finish. When he got closer she had hung up the phone and looked in his direction and smiled. "You finished with you fan club" Carrie asked jokingly. "Yeah I am. Who were you talking to on the phone?" Sidney asked casually as he opened her door to the car. "Craig and he wants us to stop by and see his place when we get back. Is that ok with you?" Sidney and Carrie got back to the condo and headed over to see Craig's place. They got to his door and knocked and a few minutes later the door opened and Craig invited them into his place. It looked just a bachelor pad with leather couches and a couple of recliners. Carrie was impressed at how nice it looked even though it was Craig's pad. "Who in the world did you get to decorate this place so fast, Craig?" Carrie asked in amazement as she wandered around the condo. "The real estate agent gave me a couple of names and I went with the one I liked the best and viola 'Chez Addison" Craig said animatedly. "Its really cool, Craig" Sidney said as he checked out everything too. "Thanks guy and its so nice to have my place now. Have a seat guys and can I get you guys anything to drink?" asked Craig. "No I am fine" Carrie said as she sat down on the couch. "Yeah I am good too. Thanks man" Sidney said as he sat down next to Carrie and put his arm around her shoulders. "So Sidney are you ready for the game on Saturday?" asked Craig as he sat. "Yeah I am ready and its going to be hard but we are up to it, I believe" Sidney said. "I am looking forward to being on the road with you guys and practicing too. Its going to be an interesting trip" Craig said. "Yeah it is" agreed Sidney. "And I am happy because I get some quiet time here in Pittsburgh" smiled Carrie. "You are going to miss me big time and all my noise and you know it doll face" Sidney laughed as he kissed her temple. "Yeah whatever Sid. Anywho I am tired so I think we need to get on back to my place but I will be back here again. I promise Craig" Carrie said as she stood up. Craig and Sidney stood up too. Carrie gave Craig and hug and he shook Sidney's hand. Then Sidney and Carrie headed downstairs to Carrie's condo. When they got into the condo, Carrie headed straight to the bedroom and started to get ready for bed. It was not that late but Carrie was exhausted with all they had been doing today and so was Sidney. They got into bed and snuggled up together. "Good night doll face. I love you" Sidney said as he held Carrie close to him. "Good night hot shot and I love you too" Carrie said as she leaned up to kiss Sidney and he happily kissed her back. The next morning Sidney had to get up early and head to the airport for his trip to Detroit. He did not want to go without Carrie but he knew she needed to stay put in Pittsburgh. Sidney was quiet as he got ready to let Carrie sleep even though she would be up shortly for work anyway but he still wanted her to sleep for a little while longer. While Sidney was in the shower, Carrie woke and went into the bathroom and opened the door to the shower. "Hey loser save me some hot water, please" Carrie joked. "If you join me then we can save lots of water" Sidney suggested seductively. "Not this morning because neither of us wants to be late" Carrie said as she shut the door on Sidney and went about her morning business. Sidney finished his shower and got out and grabbed a towel and then got ready for the day. He walked out into the bedroom and smelled that Carrie was making something in the kitchen. He got dressed and headed to the kitchen. "Its just scrabbled eggs, sausage and toast. I am going to go and shower now that you are done." "Did you eat something sweetie?" "No I am not hungry and I just threw up again but maybe after I shower and get dressed, I will eat something. OK Sidney." "Fine but I just want to make sure you are taking care of yourself and the baby." "I am fine and I will eat later. I promise." Carrie got into the shower and it felt so good and she let the water fall around her. After she dried off and then got dressed for the day. She then walked into the bedroom to find her bag and get it ready. By then she was now starting to get hungry and so she headed into the kitchen where Sidney was reading the paper and drinking another cup of coffee. Carrie sat down and ate some breakfast and Sidney smiled. They finished breakfast and then left the condo and headed to the parking lot. Sidney and Carrie went together to the arena because a bus was going to take everyone to the airport for their trip and Sidney did not really want to leave his precious Range Rover in the parking lot for the three days there were gone so Carrie would take it home and that made Sidney feel better. Sidney saw the bus and he and Carrie walked over to it. "Doll face you take care of yourself and our baby while I am working hard" Sidney said as he pulled Carrie into a hug and kissed her forehead. "I will and we will be fine. You have a good time and have a super game. I will be watching at home" Carrie said as she looked up at Sidney. "I know you will be watching and I will call you. Probably more than you want me to but I can't help myself. I love you so much" Sidney said as he leaned down and kissed Carrie deeply. "Oh please will you two get a room so that we don't have to watch you to getting it on" joked Max Talbot as he walked over to where they were standing. "Yeah I really don't need to see my twin sister and her boyfriend making out" joked Craig as he walked over too. "Whatever guys. I don't mind showing PDA with my girl so deal with it" Sidney declared. Carrie just blushed and buried her head in Sidney's chest as he held her. Carrie and Sidney kissed once more before he got onto the bus with the rest of the guys. Carrie watched as the bus headed off to the airport and then she headed inside where there were several of the Pittsburgh Penguins office people working. She went to her desk and got started on her day.